Over the years, I tried countless recipes some which met with greater success than others. I had pretty much settled in with a final recipe when I came across the Cook’s Illustrated Foolproof Pie Dough recipe. At this point, my love of Cook’s Illustrated is well established. 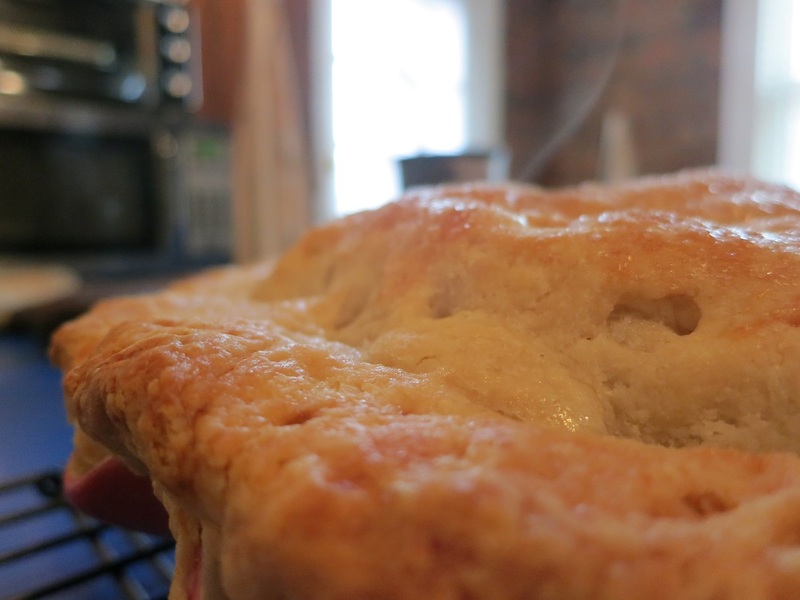 (I’ve recently had cause to question that a bit, but this is a blog about pie. So I won’t burden it with any unpleasantness.) I decided that it was worth deviating from my standard recipe to try out this new approach to crust. The secret ingredient: vodka. I could probably have used a less high quality version–Watershed wasn’t called for under the circumstances. But you use what you have, right? Once I cut into that first pie featuring the Cook’s Illustrated crust, I knew that there was no going back. That would be the recipe I would use forever and ever amen. But a good recipe is only half the battle. When it comes to making pie crust, good technique is as important, if not more so. Over the years, I’ve accumulated numerous tips and tricks, which I’ll share as well. As you can tell, there’s a theme here—you want your ingredients to be as cold as possible. 1. Process 1 1/2 cups flour, salt, and sugar in food processor until combined, about 2 one-second pulses. 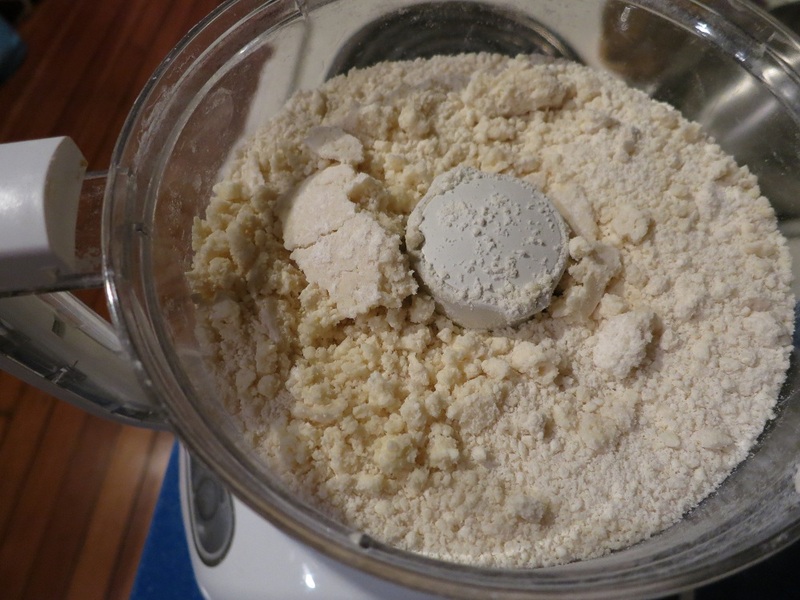 Add butter and shortening and process until homogeneous dough just starts to collect in uneven clumps, about 15 seconds (dough will resemble cottage cheese curds and there should be no uncoated flour). Scrape bowl with rubber spatula and redistribute dough evenly around processor blade. Add remaining cup flour and pulse until mixture is evenly distributed around bowl and mass of dough has been broken up, 4 to 6 quick pulses. 4. Divide dough into two even balls and flatten each into 4-inch disk. Wrap each in plastic wrap and refrigerate at least 45 minutes or up to 2 days. 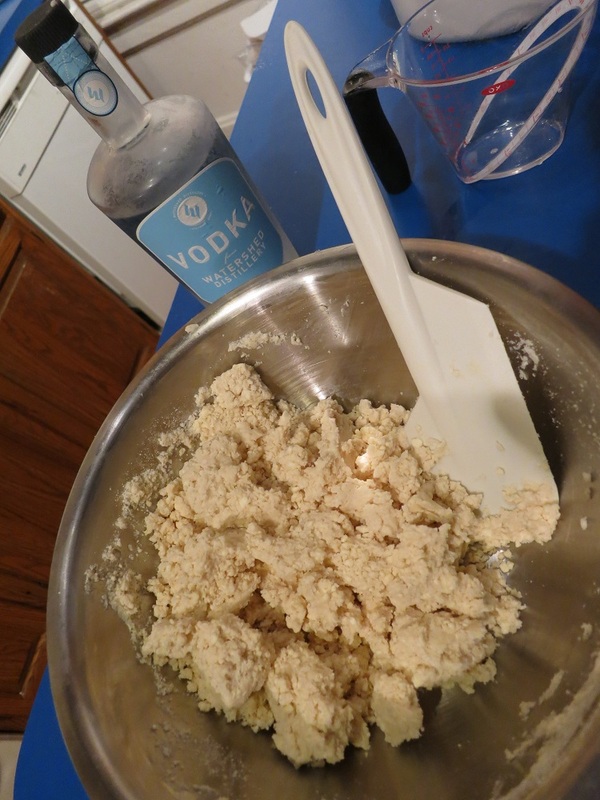 As you can see, this recipe doesn’t differ only in that it includes vodka in the ingredient list. The two- step process by which you combine the fats and flour also significantly contributes to the quality of the end result. Also, the use of the food processor, which by no means unique to this recipe, is very helpful and saves considerable time and effort. A food process makes creating pie crust so much easier! Because of the additional liquid in this recipe it is VERY sticky. Sufficiently so that it’s going to stick to your counter and rolling pin if you don’t do something about it. Some would say that you should combat this by making sure to roll it out on a well-floured surface. I have a different suggestion: plastic wrap. 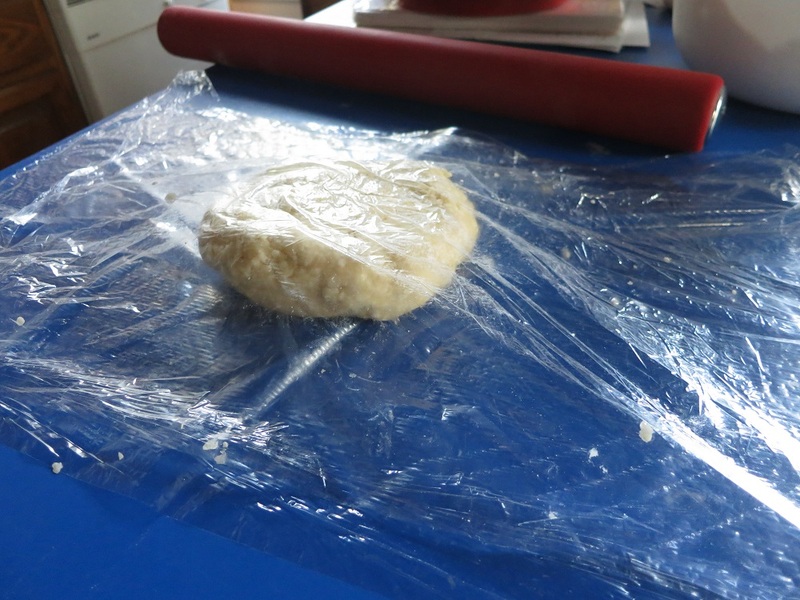 Roll the crust out between two pieces of plastic wrap. The dough will eventually expand beyond the protective sides of the plastic, but for the most part will remain well-covered. Once it’s the proper size, peel off the top layer of plastic. 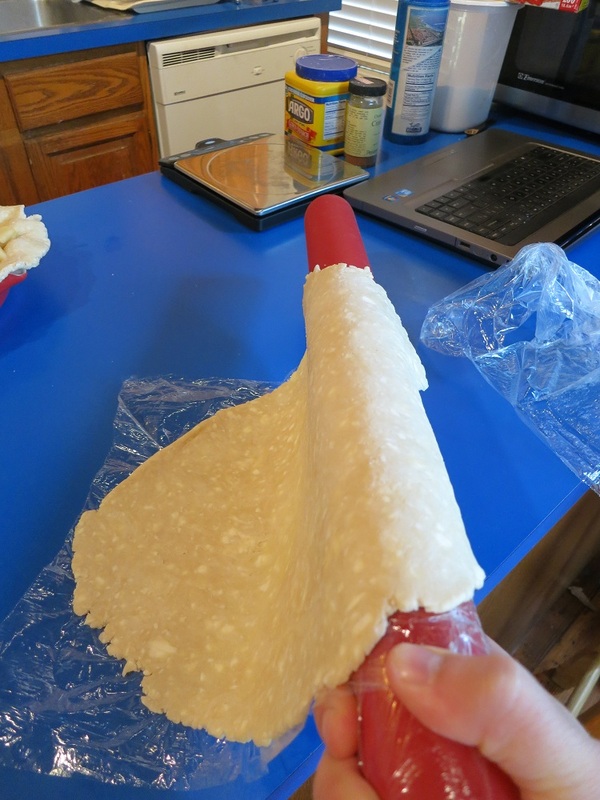 Roll the other side over the top of your rolling-pin and drape it gently over the side of the pie pan. Once you have it placed as you want it, peel off the other layer of plastic. Speaking of apples, a good recipe can’t make up for bad apples. If at all possible, buy your apples locally. 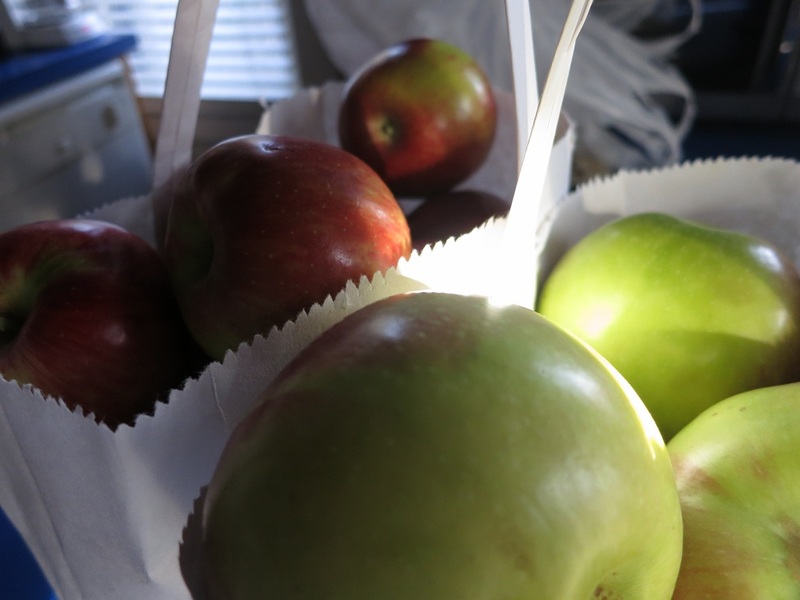 You want them to have been picked as recently as possible, and that just isn’t the case with grocery store apples. When possible, I like McIntosh or Jonathan apples. Also acceptable are Granny Smith and Galas. Whatever you do, DO NOT USE RED DELICIOUS. 2. Stir together sugar, flour, nutmeg, cinnamon, cornstarch, and salt. Mix with the apples. 3. 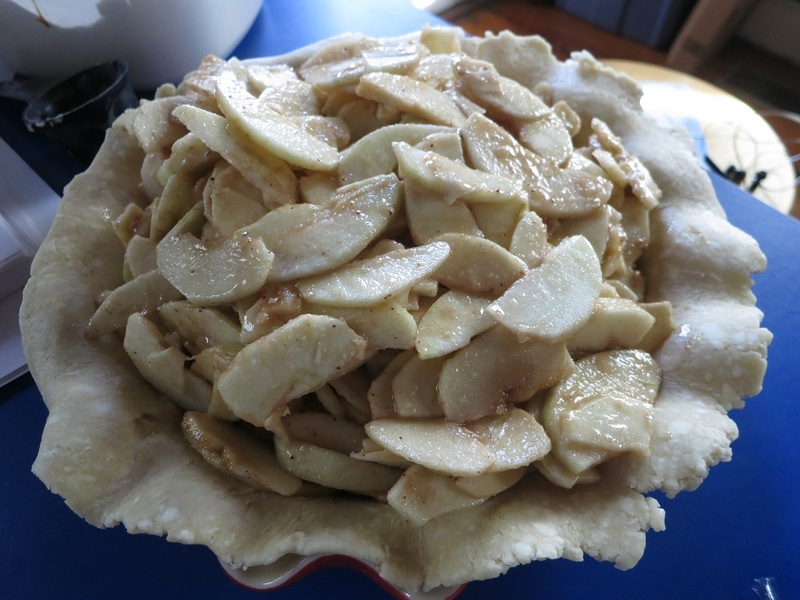 Turn filling into a pie pan lined with a bottom crust. Dot with butter. 4. Apply top crust. Seal and flute the edges. Brush the top crust with the beaten egg white. Sprinkle the crust with sugar (eyeball it, but you may wish to use as much as 1/8th of a cup of sugar.) Cut slits in the top to vent the pie. 5. Cover the edges of the pie with a 2-3 inch strip of aluminum foil. Remove foil for the last 15-20 minutes of baking. 6. Bake 30-40 minutes, or until the crust is browned. 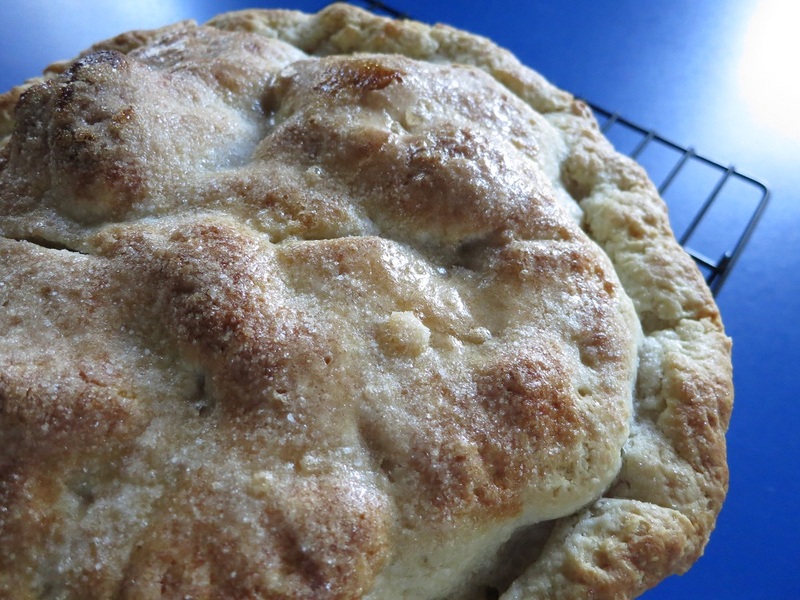 So there you have it—my well-tested recipe for apple pie. And now, I can proudly say, my well-tested, well-received, and award-winning apple pie. That’s right, this isn’t just any apple pie. It is the winner of the Brother’s Drake Meadery apple pie competition. Brothers Drake has redefined mead as a beverage. If you’ve never had Brothers Drake mead, you probably have some assumptions about what mead is like. Those assumptions would be wrong. Banish all thoughts of Vikings and Renaissance festivals. This is a high class beverage—it’s more like wine than anything else. And it’s not nearly as sweet as you might expect. Well, most of it isn’t. This looks really delicious! Congrats on the big win.